Quiz time. Look at these reactions. Ask yourself this question for each: what bonds are broken, and what bonds are formed. Don’t worry if you don’t understand the reactions. That comes later. You don’t need to understand the reactions to be able to answer this question. If you can do this successfully you are off to a good start. At least 80% of the reactions you will learn in Org 1 fall into one of these 4 categories. The sooner you can get into the habit of recognizing bond formation and breakage the better off you will be. More about each of these patterns later. It’s kinda strange in your first case that you show a covalent bond forming between sulfur and sodium. It’s also strange that you show Na-OH instead of NaOH- same goes for the sodium ethoxide and NaCN. 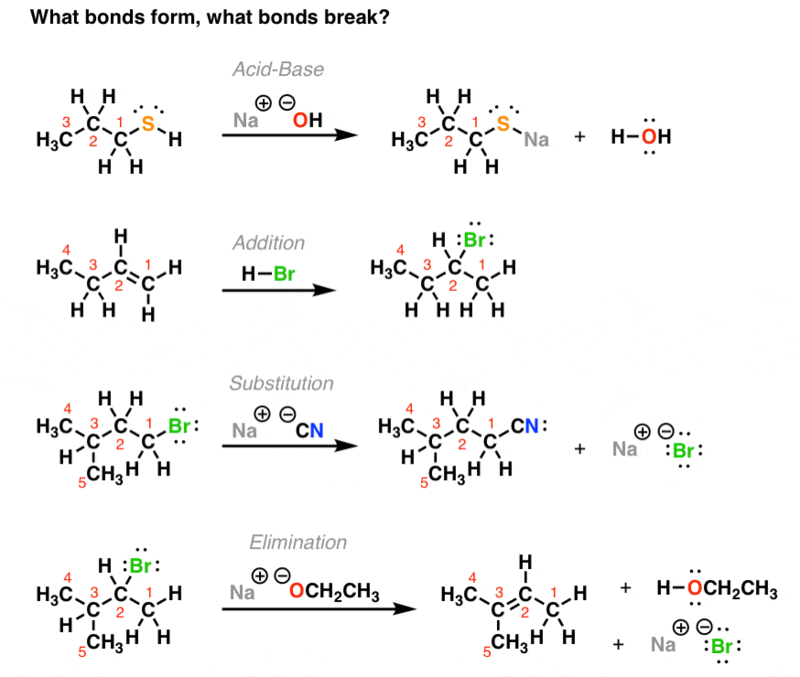 You’re right- I wanted to make it clearer for people to be able to see which bonds are forming and breaking, even if normally “ionic” bonds are drawn as covalent bonds. This is something you’ll see quite a bit of in textbooks, by the way – ionic bonds are commonly drawn as covalent, just to avoid drawing in the partial charges. You’re just supposed to “know” by later chapters that these bonds are ionic. Dig the new site design! Missing counterions drove/drive me nuts too. I am glad I’m not the only person who feels this way. How are you supposed to understand what’s going on if you’re not told half the story? I am going to write an angry rant about this. Glad the new design works for you… it was time! I do the same thing, James! Though I leave out acid/base reactions and use the line “almost all reactions in this course are either acid/base reactions or one of the following three…” as they learn acid/base reactions in freshman chemistry. You should also check out this paper too: J. Chem. Educ., 2008, 85 (1), p 83. Great, readable paper I give out to my students just at the end of the term to facilitate their studying. If you give it out at the beginning, they won’t understand it and won’t read it. I shoulda known you’d have read that paper. Yeesh. Well, it was a great paper. Thanks for making me aware of it! Edit: decided to go with ionic bond forming/breaking, don’t want to cause any confusion. I am a retired chemistry instructor now volunteering as a tutor at a small liberal arts college. How small? About 700 students. We have excellent chemistry instructors but Organic Chem is a challenge to even the best students. I like this website because before I read it I had been telling the students they would need to memorize about 625 type reactions as I did at the end of my junior year when I was preparing for the NSTA-Acs exam. Your site is very helpful. Thank you.